I went along to the carol service in Parliament Sq, testing the Serious Organised Crime and Police Act, which bans any demonstrations within a half mile area around Parliament. 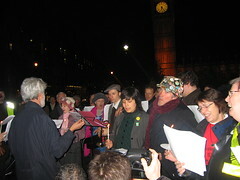 Over a 100 people (and probably around 15-20 press) sang songs for an hour. The police were not present, A Metropolitan Police spokeswoman said: “We treated the event as a carol service and not as a demonstration so the legislation did not come into play.” Thus demonstrating one of the issues with the Act – what is a deomstration. See BBC and Guardian for more info.